2006 Aprilia ETV 1000 Caponord. Picture credits - Aprilia. Submit more pictures. Never-ending roads and motorways, or dusty and lonely tracks, stretching to the edge of the world towards unknown landscapes and unknown sensations... with the ETV 1000 Caponord, the joy of travelling lasts for ever. Fuel system: Injection. Integrated electronic engine management system. Indirect multi-point electronic injection. Ignition: Digital electronic ignition with TSI (Twin Spark Ignition) with two spark plugs per cylinder. Ignition timing integrated in the injection control system. Clutch: Multiple disk in oil bath with patented PPC power-assisted hydraulic control. Freudenberg clutch line. Front suspension: Marzocchi 50 mm hydraulic action telescopic fork. Rear suspension: Aluminium alloy swing-arm. APS (Aprilia Progressive System) linkage. 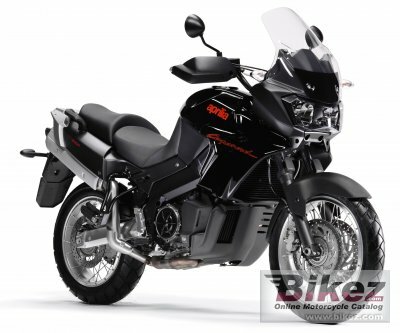 Ask questions Join the 06 Aprilia ETV 1000 Caponord discussion group or the general Aprilia discussion group. Get a list of related motorbikes before you buy this Aprilia. Inspect technical data. Look at photos. Read the riders' comments at the bike's discussion group. And check out the bike's reliability, repair costs, etc. Show any 2006 Aprilia ETV 1000 Caponord for sale on our Bikez.biz Motorcycle Classifieds. You can also sign up for e-mail notification when such bikes are advertised in the future. And advertise your old MC for sale. Our efficient ads are free. You are also welcome to read and submit motorcycle reviews.